Watching the riders cresting over the Pyrenees and cameras panning over pristine châteaux grounds, I forgot momentarily how gruelling is le Tour de France. 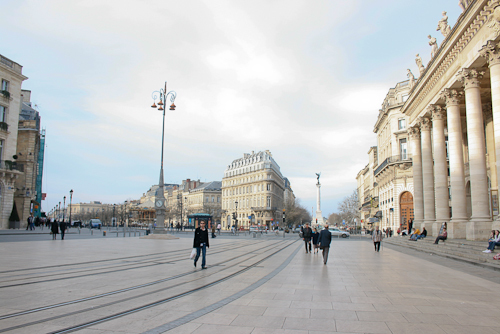 This past weekend, while they zipped through Bordeaux, I caught glimpses of familiar sights of the city. Rising crosswinds picked up, as did the riders’ tempos, and with gaps closing in between them, the battle continued! All this drama played out against the backdrop of classical and neoclassical architecture and triggered memories of my trip there last winter. I had been so impressed with this majestic city and was surprised to learn that it hadn’t always shown itself in this light. In fact, residents claim that until recently, it was soot-covered, lifeless, and long past its prime. (I roll my eyes in disbelief) However, in the last 10+years, thanks to the leadership and visionary efforts of mayor Alain Juppé, the city has undergone an urban project yielding tremendous improvements: cleaning and restoration of building façades; rezoning of urban areas; development of the quays along the Garonne river; and the commissioning of a new light rail system that now weaves through the city, its tracks seamlessly integrated with plaza and pavement. It’s so quiet; you have to be careful that it doesn’t sneak up behind you. 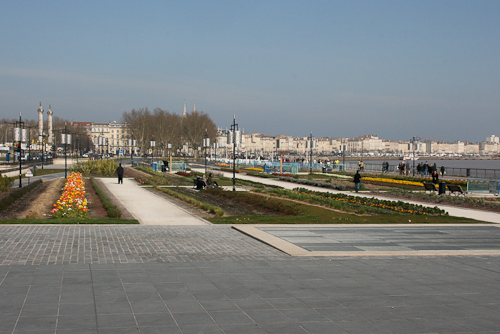 Goes to show what effective collaboration of interested parties does: architects, town planners, historians, researchers worked together and jointly with Monsieur Le Maire to renovate the waterfront and beautify the splendid buildings, some of them from medieval times. 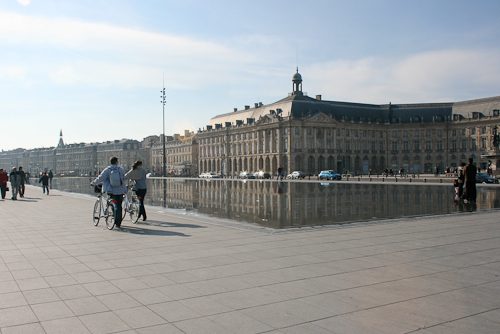 Bordeaux is on the list of UNESCO World Heritage Sites and, as I’ve read “has more protected buildings/historic monuments than any other French city except Paris.” No doubt being featured on ‘The List’ has had a highly beneficial impact on tourism. 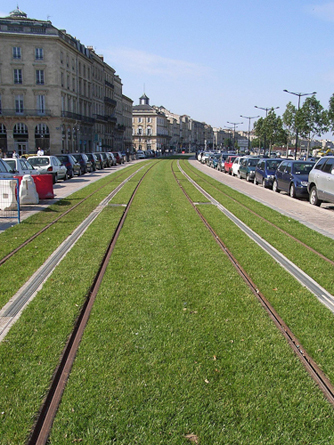 The draw for me, however, was the cultural appeal of this stony French city and I loved the promenades, parks, tree-lined squares, and the grass-filled tram tracks along the waterfront (they’re lucky they don’t have to deal with salt). 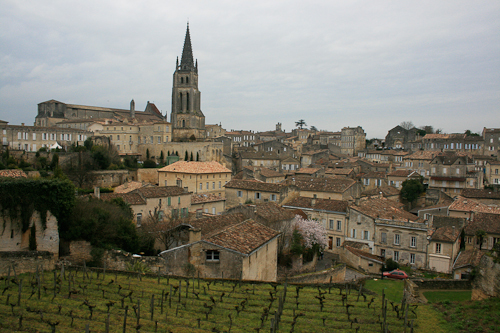 Since we were in the hood, we made a quick jaunt over to St. Emilion, a picturesque village just 35 km northeast. On a very grey day, we explored its fascinating underground catacombs, Romanesque churches and ruins stretching all along steep and narrow streets. Not to harp but, this being mid-February, it wasn’t particularly animated and the cold travelled right through us. Instead of trying one of the specialty fine wines from this historic vineyard landscape, we shockingly stopped for hot chocolate. 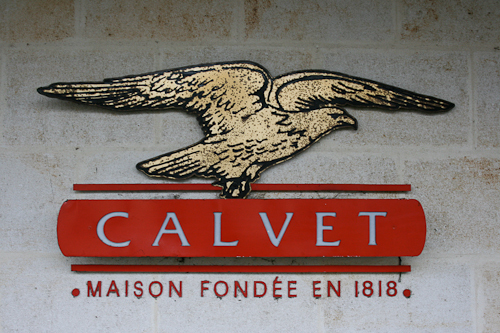 Back in Bordeaux, I insisted on making one last stop – La Maison Calvet – a winery with my same name. I cannot claim to have any direct family heritage per se but proudly showed my i.d. and they were more than happy to give me a tour of the cellar and a visit of an authentic wine merchant house. I woke up to this view today. Not too shabby, eh? Cascading rooftops, sprawling vines, and random glimpses into neighbouring apartments. It’s not the panorama of the city I had from JP’s in Montmartre but it pleased me nonetheless. I’ve enjoyed ‘la vie quotidienne‘ in Le Marais district: boutique shopping (July is the month of sales), gallery hopping and, naturally, stopping for a café crème is ‘a must’. Paris has been good to me on this trip. I’ve been here already several times in my life but have never enjoyed it as much as I did this time. I couldn’t resist taking these pictures of the apricots because the saturated colours captivated me so. It was the afternoon of July 14th and preparations were underway for a picnic in the park just below the Eiffel Tower, in the Champs des Mars. I had never before celebrated Fête de la Bastille in France so I was particularly excited. Festivities were to begin in short order. It was a memorable night. My Parisian friends invited me to stay with them. 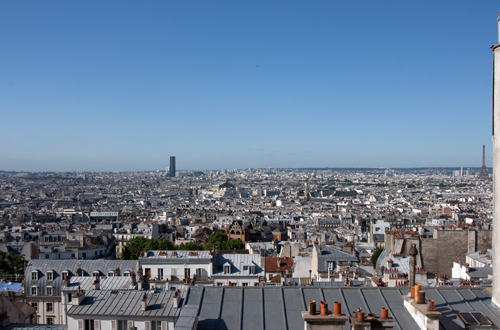 Fortunately for me, they live in the fabulous Montmartre district and I was blessed to have the panorama of the city as I did. From my room, I had views of which I could identify, as countless landmarks, the following: la Tour Eiffel, la Tour Montparnasse, l’Opéra Nationale, l’Eglise des Invalides. I picked up a copy of the Pariscope and lined up some activities for the week that included: a visit to the Musée Rodin, ‘Parrworld‘ – a Martin Parr photography exhibit at the Musée du Jeu de Paume at the Place de la Concorde, a stroll through the (gardens of) Jardin des Tuileries and Jardin du Luxembourg, where I engaged in a friendly chess match with a transplant from Barcelona, the city of my father. What I enjoyed most of all, however, was the exhibit ‘l’Art du carnet de voyage‘ at the Musée de la Poste. Displayed were travel sketchbooks of illustrators and globe-trotters, whose artistic expression was captured in varying techniques of watercolour, pen & ink and graphite – drawings of landscapes, street scenes, people and architectural details. Knowing full well that you need a lifetime to discover Paris, I didn’t even try to do everything on this trip. I was seconds away from heart failure when I realized I no longer had my wallet, and then just nanoseconds from complete cardiac arrest when I remembered that it also contained my two passports. It then occurred to me that I must have lost it earlier on the bus from Arles to Aix-en-Provence when I was engrossed in a conversation with a photographer from Stockholm and had been inattentive when putting down my bags. I made the necessary calls and, would you believe, was so fortunate to be in touch that Friday afternoon (before the long holiday weekend in France) with the bus company that had had it turned in. That’s when I realized I have a little angel. My Italian friends are so lovely. Upon learning of my misfortune, they drove me that evening to Arles to meet the conductor who, by slim chance, had spotted my little blue ‘pochette‘ when returning the bus to the depot and reported it. After the hour-long drive, I excitedly went to retrieve my wallet and returned to my awaiting friends, wallet secure in hand, and whispering words of thanks. 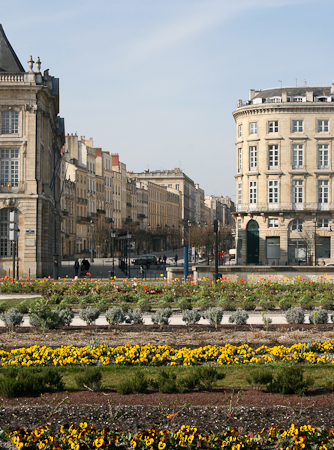 We came across the highly recommended and most charming Jardin des Arts restaurant, across from Le Museon Arlaten. The girls and I had walked by the restaurant numerous times during the week there – Arles is quite small – but rather than be drawn in, we passers-by were merely tempted by its artisan ice creams at the street-front. But tonight we dined on the outside terrace that opens out to a leafy cloister courtyard adjoining the Espace Van Gogh. Treating myself to an outrageous dessert, un fondant au chocolat, I savoured my last and unexpected evening in Arles. When night fell, we headed back home. Arles. (All) Things Medieval. (All) Things Roman. La famille Severac hosted us in their home for the week of July 6th-12th, thanks to a little online ad investigating and what’s more likely, good timing. Due to the town’s hosting of one of the world’s leading photography festivals, Arles was booked solid already months in advance! A recently retired couple that once owned an olive grove had two bedrooms to share in their private upstairs quarters – the perfect hosts for an uncommercial B&B, no detail left uncovered. Not yet fully adjusted to their quieter lifestyle, frankly, I think they welcomed visitors. The decoration of their living room alone completed the experience for me: rustic furniture, a massive wooden chest which could very well have been Louis XV, Arlesian ceramics, paintings of La campagne, etc – like right out of an Architectural Digest, ugh, no, strike that, a Maison Française magazine. They took an immediate interest in us – 3 Japanese girls and me. Thankfully, I speak fluent French so I became the translator for the week. Every morning, breakfast was prepared and set out for us in the backyard by the pool. And every day, something new awaited us: never the same breakfast twice. A different type of homemade jam (gooseberry, watermelon, apricot), bread or pastry greeted us daily. The Severacs insisted on making a special lunch for us on our last day there: homemade pizzas, made in their exterior coal/brick oven. So early on Saturday morning, in the shade of the porch, the Madame made the dough from scratch while the Monsieur set out to buy only the freshest ingredients at the Provençal market. I learned that the locals (the Arlesians) go there super early and that it’s only the tourists, like us, who set foot there after 10h00. ☺ The market was situated on Boulevard des Lices but then overflowed through some of the adjacent winding streets. We sampled wines, honey, olive oils, sausages, and cheeses (I liked the chèvre/brebis combo), gawked at the colourful produce & flowers, bins of herbs and spices, ceramics, linens, socks & undies and sifted through clothing – most of which was from Italy. After a joyful morning of cruising the weekly marché, one of the largest in Provence, we returned home and, together with their visiting son and his family, we all shared 5 types of pizza under the olive trees and canopy, sipping festive drinks and wine. Ah, life is easy here in the south. Every Wednesday at 17h00 is ‘La course camarguaise’, the Camargue bull game, in les Arènes, a historic Roman arena. Naturally, I insisted on going and was able to convince my travel buddy Elli to join me. We didn’t know what to expect other than the fact that we were assured that the bulls are not killed at this event as they typically are in French & Spanish bullfighting, la corrida. Athletic young men, ‘les razeteurs’, who train all year long to face the beast, are dressed in white and in this run, try to pull off strings tied to its horns, putting their lives at risk. Each of the attributes is worth points and a bonus; thus, they are ultimately added up and money is won. In the course of shepherding the bulls, now and again the creatures are pegged with a stick or a rake-like object. Granted, it is not nearly as brutal or inhumane as traditional bullfighting, however it was pretty cruel and painfully obvious to me that the bulls didn’t seem to like it one bit. Not one iota. Instead of charging towards the lithe white sprites scurrying around the field, and to the dismay of the crowds, they repeatedly attempted to flee the scene, hurling their large torsos over the fence. Bulls are at the center of many of the cultural traditions. Their presence in this official sport contributes significantly to the economy and it’s not going anywhere soon. Upon entering the arena, to shield myself from the scorching afternoon sun – Arles gets, gasp, more than 300 days of sun per year! – I bought a typical straw hat from one of the vendors. However, on the way home, and before I could object, a quick unexpected breeze handed it off to the Rhône River.